I am the artist and author of a series of coloring books published by Ave Maria Press. 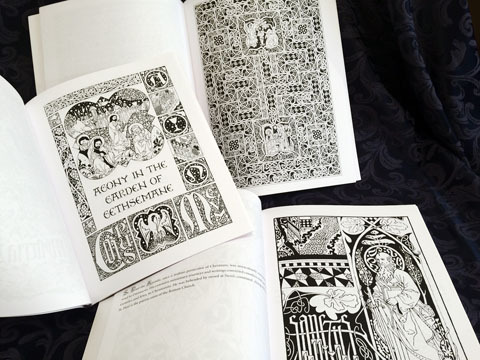 These are marketed as coloring books for adults, but I hope that they will be enjoyed by both adults and children; my own kids like them, and I think they would be put to good use in religious education classes and Catholic schools. I do not think that there ought to be two different types of coloring books, one with sophisticated artwork for adults and one with insipid artwork for children; I think that everyone, no matter what age, deserves detailed, challenging artwork. I believe that a true restoration of sacred art can only begin if there is a widespread participation in it by both professionals and amateurs. The popularity of adult coloring is, to me, an encouraging sign; too many adults have the idea that art is an activity for children, and that they are incapable of improving their own ability to draw. But drawing is an attainable skill; anyone who can write his name legibly can learn to do it. Coloring books are a fine, unintimidating way to prompt artistic activity among people of all ages and all levels of current ability. Please see also the coloring sheets that I have made available for free download.